Typically the high point of the RC44 season, this year's World Championship is doubly important coinciding with the 10th anniversary of the class, that was originally conceived by legendary America's Cup skipper Russell Coutts and bears his initials. While Vladimir Prosikhin's Team Nika will be looking to defend its 2015 title, the stand-out boat after the first event of this season in Bermuda was Chris Bake's Team Aqua. Because of this, Team Aqua has recovered the coveted 'golden wheels', the RC44 equivalent of the Tour de France's yellow jersey. However the defending champion in Sotogrande, in fact more accurately the winning helm from 2014, when the RC44s last visited this luxury resident marina development, situated 25km east of Gibraltar, is Slovenian skipper Igor Lah. Two years ago Lah, the 2013 RC44 World Champion, stood in for Vladimir Liubomirov on the Bronenosec Sailing Team. This time he is back in Spain with his own Team CEEREF, looking to repeat his success. "It is great to be back - it is a nice location and I love the event here," said Lah, who is suffering slightly following a knee operation. "I'm looking forward to this event and sailing in good wind. I just have to be really careful." Team CEEREF was out training yesterday in winds gusting to 28 knots. However no teams have a greater appetite for victory here than the 'home team', John Bassadone's Peninsula Petroleum, whose bunkering business was founded in nearby Gibraltar, 20 years ago. Among the Peninsula Petroleum crew are several locals including America's Cup sailor Pablo Rosano and trimmers Oliver Gongora and German Panei, the latter originally from Argentina, but now a Sotogrande resident. "It is a good place to sail," says Panei. As to whether they have any 'local knowledge' advantage, Panei is candid: "It depends on what course it is. We usually sail very near the shore, so if we sail there then maybe we have an advantage." The Argentinian headsail trimmer adds that, as home team, they are feeling the pressure slightly. "We need to make that work in our favour. It's difficult, but we'll try." Typically close to the Strait of Gibraltar and the Atlantic Ocean, the wind either blows strongly from the west or slightly less strongly from the east. Panei reckons that this week it will be the former, the Poniente, born out by the forecast which shows 15-20 knots westerlies blowing until the light final day this Sunday. "For me the Poniente is more fun: It's stronger and very shifty," says Panei. Keen to perform well this week the Peninsula Petroleum team has managed to get in the most training, starting last weekend. "We want to be the best prepared we can be," says Panei. Several teams are returning to the RC44 circuit now it is back in Europe, having not raced in Virgin Gorda in December or in Bermuda. This includes Frenchman Hugues Lepic and Aleph Racing, plus Monaco-based Dutchman Nico Poons and Charisma. Then, bringing the number of teams at this world championship up to 11, is the new Blackwater Team of Russians Alexander Zaytsev, Andreas Savvidis and Maxim Merzlikin from Skolkovo Sailing Club on the outskirts of Moscow. Also making a concerted effort to get on the World Championship podium is Katusha's Alexander Novoselov, who on this occasion is getting to helm for the whole regatta, rather than sharing the wheels with his partner in the boat. "The wind will more challenging this week - it will be difficult, but that makes it more interesting," says Novoselov. 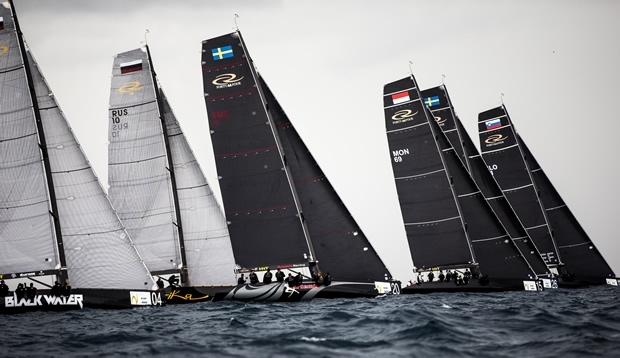 The RC44 World Championship Marina de Sotogrande starts with a day of match racing tomorrow at 1130 CET at before moving into four days of fleet racing, culminating in the 10th anniversary year World Champion being crowned.